GARBAGE HAVE SOLD OUT THEIR NOV 8 SHOW AT LONDON’S O2 BRIXTON ACADEMY AND HAVE ADDED AN EXTRA DATE AT THE SAME VENUE ON NOV 9. 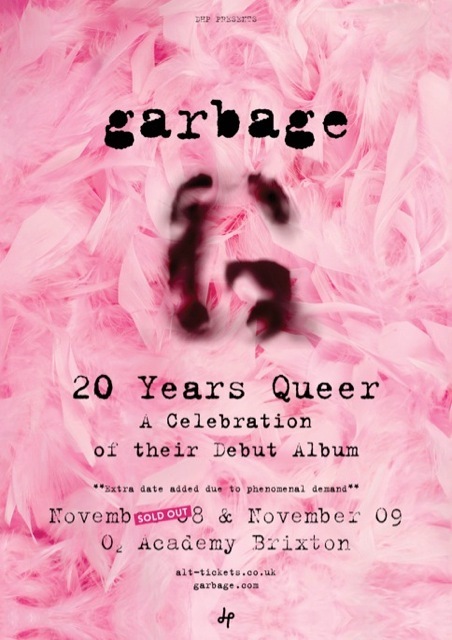 TICKETS FOR THE ’20 YEARS QUEER’ SHOW – A CELEBRATION OF THE BAND’S GROUNDBREAKING DEBUT ALBUM ‘GARBAGE’, WENT ON SALE AT 9AM THIS MORNING, (MARCH 6) AND ARE NOW SOLD OUT. Garbage have sold out their Nov 8 date at London’s O2 Brixton Academy and have added a second show at the same venue on November 9.